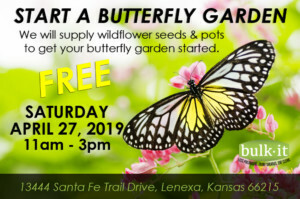 Join us on Saturday, April 27, 2019 from 11am to 3pm and start your own butterfly garden! We will supply wildflower seeds and pots to get your butterfly garden started. FREE! Enter your email address to subscribe to our blog and receive the latest news and promotions directly into your email!